NeuroTags help manufacturers keep track of their products and prevent counterfeiting with the help of tag-couple technology and powerful AI cloud. The steady rise in the growth of counterfeit products has created a negative impact in the world market. Apart from having tremendous business potential, India stands as a major market for counterfeit products. Counterfeiting is spread across all the sectors/industries like pharma, retail, FMCG, etc. from toothpaste to aspirin and to high end handbags, counterfeit products exist everywhere. The problem arises with the companies not being able to track down this market and collect their end consumer data and are unable to keep an eye on the distribution network. NeuroTags is the one-stop solution for counterfeits and fake. It can save customers from buying a fake product by scanning the tag placed on the product, which also gives them referral and loyalty points. These points can then be used for getting discounts on further purchases. NeuroTags provides mathematically coupled tags, namely open and protected. The open tags are visible on the product and can be scanned by anyone to get the information of the product and gives an indication of authenticity with certain probability. Once a product is purchased, the user has access to the protected tag, which is protected by a scratch layer, or is kept inside the product seal. After scanning the protected tag using the smartphone, a user gets the authentic information with certainty. Also, users can avail warranty, loyalty and referral points after scanning this tag. The tags are connected and protected by algorithms on the server in such a way that, if anyone tries to replicate the tags, it gets caught and the copied product gets invalidated. 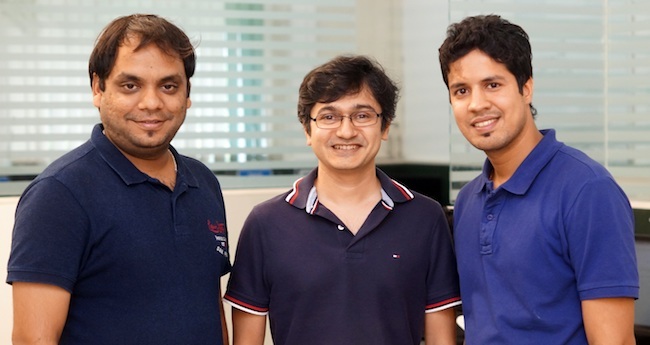 NeuroTags was launched in January 2017 by a team of three techies- Nitin Gupta, Yogesh Miharia and Abhishek Agarwal, who co-founded the company. They have all worked in the hard-core tech and startup sector. Nitin Gupta, who is the CEO of the company interacted with TNM about the concept of NeuroTags, the technology behind it and long-term goals among other things. What is the concept of NeuroTags? NeuroTags is a unique anti-counterfeiting digital solution with the mission to make the world free of counterfeits. We help manufacturers keep track of their products and prevent counterfeiting with the help of tag-couple technology and powerful AI cloud. We also help companies acquire their offline end customers’ product interaction data and run analysis to make better-informed decisions. We have add-on modules to help brands market better and retain their customer loyalty via eWarranty, loyalty and referral programs. When and how did you conceive of this idea? While watching a documentary on the counterfeit market and how counterfeiting is affecting the society negatively, we asked ourselves if we can solve this problem with technology. Later on, with further research, we found that the market in India is about Rs 40,000 crore and overall its a $1.6 trillion problem across the world. After a thorough research of the anti-counterfeit solutions present in the market for this problem, we came up with NeuroTags in 2017. It took us about a year to build the technology and run the pilots and in January 2018, NeuroTags was rolled out in the market. Later, according to the clients’ needs, we enhanced our technology by adding various other offerings such as the offline end customer data collections, eWarranty, loyalty and referral programs. What is the technology behind this and is it the only one of its kind in the world? NeuroTags provides algorithmically coupled tags, namely open and protected. The open tag is visible on the product and can be scanned by anyone with a smartphone to get the information of the product and an indication of authenticity with a certain probability. Once a product is purchased, the buyer has access to the protected tag, which is protected by a scratch layer or is kept inside the product seal. After scanning the protected tag, user gets the authenticity information with certainty and the product gets registered to the customer. Also, the user can avail warranty, loyalty and referral points after scanning this tag. The tags are connected, monitored and protected by algorithms and AI on the cloud in such a way that, if anyone tries to replicate the tags, it gets caught and the copied product gets invalidated. Yes, we are unique and have filed the patent. From the business perspective, we are very cost effective and high quality. Our offerings help businesses grow their sales, boost customer confidence in their brand and help make better-informed decisions with the data collected in the offline world. How many people worked on the project, what kind of challenges did you face? From January 2017 to January 2018, was the time when we rigorously worked to build the team and technology and are still working on the same to make it better. Initially, the challenge was to convince the companies and penetrate the market, as nothing has been done like this before. But now, we are seeing traction. Which sectors does this benefit and who are your major clients? The problem of counterfeit is faced by every sector, and our technology can easily be adopted by any sector. We have around eight clients and are in talks with many other brands. Have international companies approached you? Yes, we are in active conversations with a few MNCs. When do you expect the patent to get approved? We have filed the patent in India and US. We plan to extend it to EU too. It could take years for the patent to get approved. What are your long-term goals with this product? We aim to be a de facto trusted authority for any type of product developed in the world. Strategically, we are aiming to add some useful offerings to boost marketing and sales. We are at a very early stage of exploring the VR-related requests that we have received from some of our potential clients.